There are many lovely gardens to visit in Wales, these are four of my favourites. 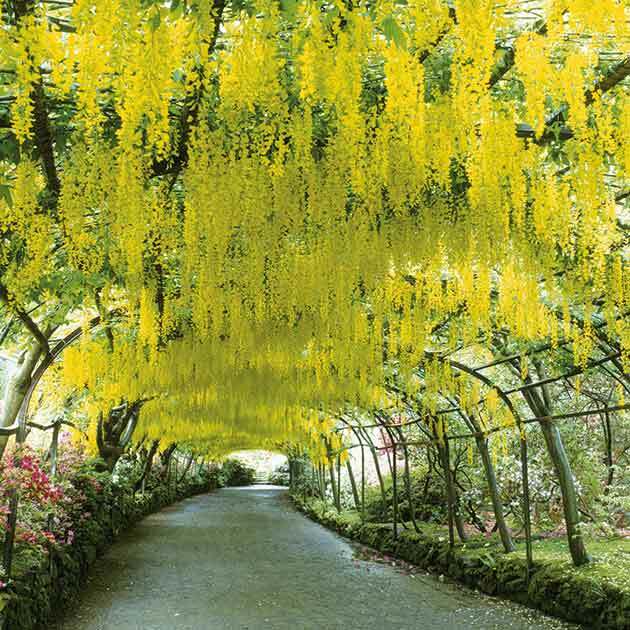 A visit to Bodnant Garden near Conwy is a great day out at any time of year, but especially in late May and early June when the 55m-long laburnum arch drips with long yellow blooms. Throughout spring, the Dell, a deep valley with numerous streams, comes alive with rhododendrons, azaleas, camellias and magnolias and leads to a viewpoint over the River Hiraethlyn far below. Here, you’ll also find some noteworthy trees such as the giant redwood, Sequoiadendron giganteum – which is over 47m tall –and a 48m tall Oregon Douglas Fir. Although an established parkland, the garden was first laid out by the Victorian entrepreneur and passionate gardener Henry Davis Pochin in the latter part of the 19th century. The garden he created, with the help of the landscape designer Edward Milner, features five Italianate terraces overlooking the Snowdonia mountain range. 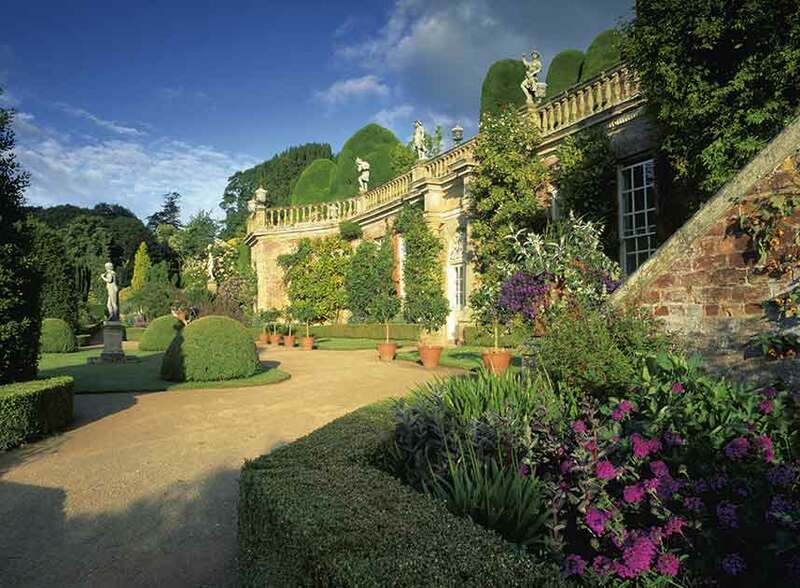 Discover the Croquet Terrace, the rose garden and lily pools, and the architectural ornaments. A great photo opportunity can be found on the Canal Terrace, which features the iconic canal pond and 18th century Pin Mill. Bodnant Garden is noted for its botanical collections, and is also well known for its breeding programme, especially of varieties of rhododendron and azaleas. Covering 568 acres of the 18th-century Middleton Hall Estate in Carmarthenshire, the National Botanic Garden of Wales features a landscape with meadows and woodlands that come alive with wild flowers in spring, as well as a garden that looks good all year round. In the hub of the garden is Lord Forster’s Great Glasshouse, the largest single-span greenhouse in the world. Inside, you’ll find a huge selection of Mediterranean floras. Travel through 150 million years of botanical history within the protected environment of the Double Walled Garden, where there are four quadrant beds that tell the story of the evolution of flowering plants. There is also a working kitchen garden that reflects this area’s original use. Inside the Double Walled Garden, you’ll find the Tropical House with plants like orchids, bromeliads and palms. The Botanic Garden also boasts lakeside walks with places to watch wildlife; there’sa Japanese garden that’s a miniature world of mountains, forests, lakes and oceans and which comes alive in spring with cherry blossom, camellias, rhododendrons and azaleas, as well as a herb garden that is home to native plants. Wales’ ‘rarest’ tree, Ley’s Whitebeam (Sorbus leyana), is located behind the Theatre Botanica. It is just one of 17 left in the wild areas of the Brecon Beacons. It flowers during May and June. Set in a secluded area of rural mid-Wales is the Dingle Nursery and Garden – the lifetime work of Barbara and Roy Joseph. This internationally acclaimed four-acre garden is, with the help of the Royal Horticultural Society, a wealth of interesting plants and trees. It is especially known for its colour-themed and unusual planting with year-round interest. Each bed has its own theme, such as subtle shades of browns and creams and silver foliage with pink, white and pale lilac. Other areas are filled with reds, oranges and lime green. Each area holds a surprise, like the specimen of the wedding cake tree, Cornus controversa ‘Variegatus’, in a pot sunk into the ground. The steep, south-facing site slopes down to a deep lake with a small waterfall in the bottom garden, taking in walks through primrose woods, which are stunning in spring when the magnolias are in bloom. May is a good time to visit with rhododendrons and azaleas at their best. 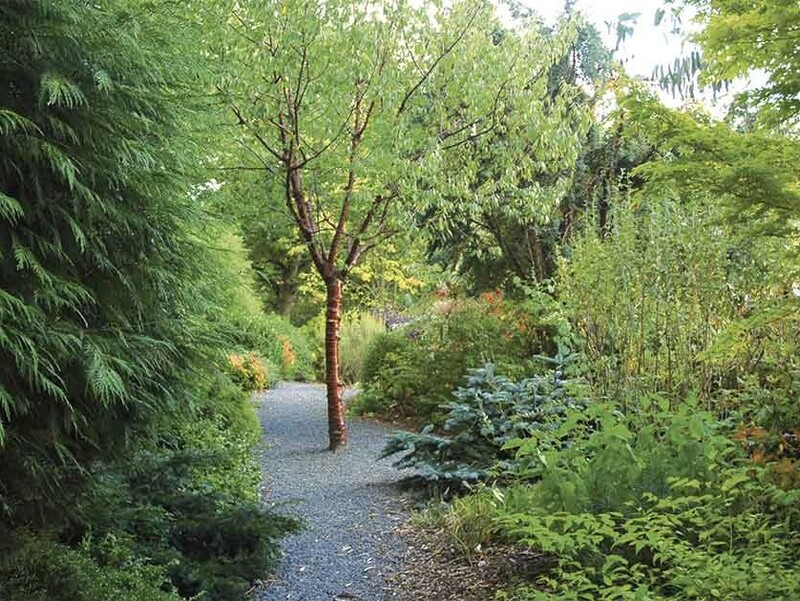 Walking along the winding paths, which are set against a colourful backdrop of mature conifers, you’ll see noteworthy plants such as pittosporum, abutilon, hoheria and piptanthus, also known as the evergreen laburnum. Interesting trees include cercidiphyllum, the giant-leaved Indian bean tree or catalpa and tulip trees. The garden draws a great variety of wild birds from the surrounding countryside, so have your camera handy. Powis Castle towers above its terrace garden, which was mostly created in the Late Renaissance period, stepping down the hill to one of the most beautiful gardens in the British Isles. The terraces shelter astonishing topiary, including 14 sculpted yews that overflow down the walls to the terrace below. Notably, they feature original lead statues, an orangery and an aviary, plus a collection of rare plants in herbaceous borders and ferns. Owned by the National Trust since 1952, the garden is famous for its tender perennials, particularly a silver artemisia, which is nurtured in the greenhouse and planted out each spring. Another terrace has scented tender rhododendrons. These grand terraces look across to parkland, and are a vantage point to enjoy spring bulbs. Old apple trees, which are shaped as pyramids, area highlight at blossom time and in the summer there are borders filled with old roses and herbaceous perennials. 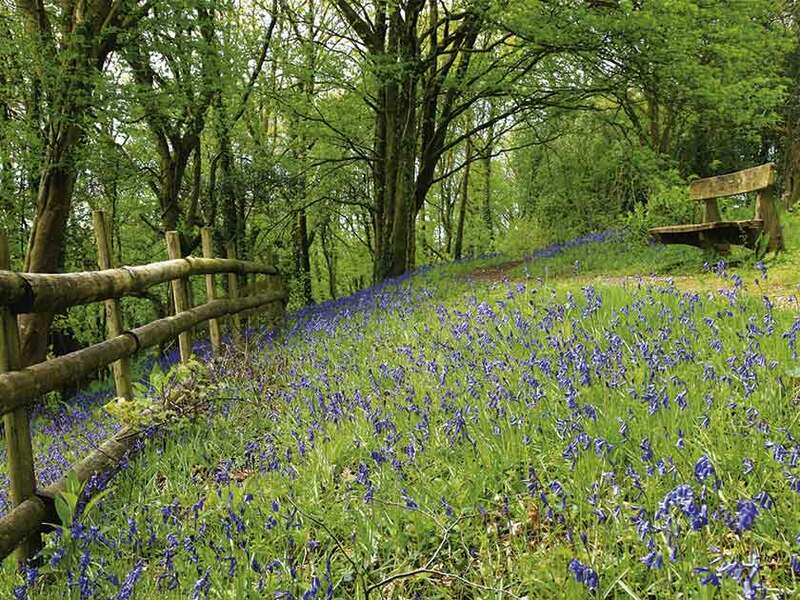 Stroll the woodland and you’ll come across rhododendrons and azaleas, magnolias and wild flowers. Don’t miss the amazing gardens in Scotland, England and Ireland, too!